Because gold forms few compounds, finding true gold ores is difficult. 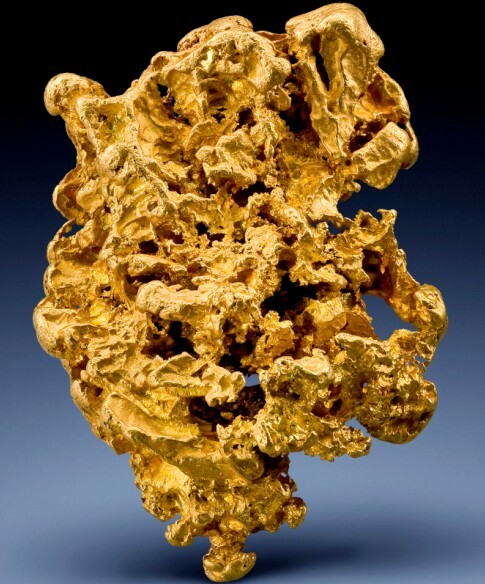 However, there are gold ores producing relatively small percentages of gold per pound that can be processed. A few examples are : nagyagite, calaverite, sylvanite and krennerite. Gold forms few compounds. So, finding real gold ores is hard. Some gold ores less interesting to commercial gold miners can give you a bit of gold when processed. The most common compounds include: nagyagite, calaverite, sylvanite and krennerite. Color is golden “butter” yellow. Crystal Habits include massive nuggets and disseminated grains. Also wires, dendritic and arborescent crystal clusters. Associated Minerals include quartz, nagyagite, calaverite, sylvanite, krennerite, pyrite and other sulfides. Other Characteristics: ductile, malleable and sectile, meaning it can be pounded into other shapes, stretched into a wire and cut into slices. Notable Occurrences include California and South Dakota, USA; Siberia, Russia; South Africa; Canada and other localities around the world. Best Field Indicators are color, density, hardness, sectility, malleability and ductility.